Ceyda Karan (left) and Hikmet Cetinkaya, columnists for Turkey's Cumhuriyet daily, are on trial for reprinting cartoons from Charlie Hebdo. Two of Turkish President Recep Tayyip Erdogan's children are better known by the public than the other two. His 34-year-old son, Bilal, made his debut at the Turkish hall of fame when recordings of phone-tapped conversations he had with [then prime minister] Erdogan were leaked on the internet. The recordings appeared to capture the prime minister passionately instructing his son to dispose of large amounts of hidden funds from their private home in the midst of a corruption investigation. Although Erdogan later admitted that his private phones had been tapped, he rejected the telephone conversation with Bilal as "complete lies," fabricated by an Islamist group that wanted to discredit his government and take over state institutions in Turkey. Erdogan: "OK, so what I am saying is, get all that stuff in your house out. OK?" Bilal: "Dad, could that be? There is your money in the safe." Erdogan: "That's what I mean." Erdogan: "Did you make most of it vanish?" Bilal: "We haven't been able to do all of it yet. There are about 30 million euros left. We haven't been able to get that out yet." Erdogan's daughter, Sumeyye, devotes most of her time to social work. She is the vice president of the Women and Democracy Association, an NGO "advocating women's rights." But Ms. Erdogan has a different vision on women's rights. In a speech earlier this year, she defended an Islamic commandment that male children inherit more than their female siblings. Ms. Erdogan rejected any link between Islam and gender inequality in most Muslim countries. But how did she justify the inequality between the two sexes when it comes to inheritance, in light of the Muslim holy book that commands that "God decrees a will for the benefit of your children; the male gets twice the share of the female"? 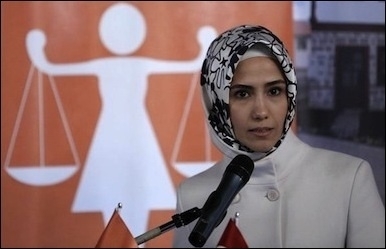 President Erdogan's daughter, Sumeyye, considers herself a "women's rights" activist. She explained: "[People question] why more inheritance goes to the male child and less to the female. When we analyze this, we see that this is because the male child is given the responsibility to earn [a family's] living. So naturally it is only natural and fair that the male child inherits more." That was how Ms. Erdogan wanted to defend women's rights. Recently, the two Erdogan siblings and the president's son-in-law, Berat Albayrak, a wealthy businessman who was elected to parliament in June's elections on the president's party's ticket, appealed to a Turkish criminal court that is trying two journalists, with a request to become plaintiffs in the case. 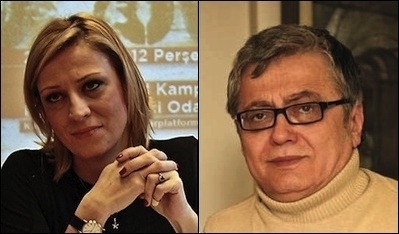 The case is against Ceyda Karan and Hikmet Cetinkaya, columnists for the secular, left-wing Cumhuriyet daily. After the Islamist attack on the French satire magazine Charlie Hebdo in January (an attack that killed 12 people), the Turkish columnists, in solidarity with the French magazine, displayed the Charlie Hebdo cartoons in their columns. They now, in connection with the cartoons, face up to four years and six months in jail on charges of "inciting public hatred" and "insulting religious values." The prosecution asked the judge to issue an arrest warrant for the two journalists, who said they were out of Istanbul on a work trip. The hearing was adjourned to Oct. 12. Karan and Cetinkaya were not present at the first hearing, but about 100 plaintiffs were. Most plaintiffs described themselves as readers offended by the columns. If the Erdogan siblings join the group of plaintiffs, they will be joining a group with quite interesting ideas. For instance, one plaintiff, during the hearing, said that publishing the Charlie Hebdo cartoon was like "pouring gasoline on a fire" in an overwhelmingly Muslim country. One of the plaintiffs suggested that the judge permit them to lynch the journalists. Another went further down the Islamist route: "If the court does not punish them, let us punish them," one said, clearly asking the judge to permit the group of plaintiffs to lynch the journalists. "We should not leave [their punishment] to afterlife," the angry plaintiff said in the courtroom. And another plaintiff asked the judge to "silence the Cumhuriyet daily." Mustafa Varank, an aide to Erdogan, is also a plaintiff. Such is the profile of the plaintiffs in the trial of two journalists who only wrote their columns and published Charlie Hebdo cartoons in a presumably secular country that happens to be a candidate for European Union membership. It is not surprising at all but thought-provoking, to put it mildly, that President Erdogan's son, daughter and son-in-law are so passionate about joining the ranks of "provoked Muslims" who demand from a judge a permission to lynch journalists and shut down their newspaper. Cumhuriyet and its journalists are becoming increasingly intimidated by the Erdogan family. After the newspaper published documents and photos showing Turkish intelligence transporting arms to jihadists in Syria, prosecutors indicted its editor-in-chief, Can Dundar, demanding two life sentences plus 42 years in prison on multiple charges, including military espionage and being a member of a terrorist organization. In the run-up to the June 7 elections, Erdogan personally got involved in the Dundar case and publicly said: "He [Dundar] will pay a heavy price for that. I won't let him go away with this." See the common thinking? In one case there are two defendants being tried in a court, but one plaintiff asks for their lynching -- without a court verdict. In the other there is another defendant and the president of the country promises that he will pay a heavy price for what he published -- again, without a court verdict. None of this is coincidence. The civilized world should support Cumhuriyet and its journalists, who have been found guilty by the Erdogan family -- without trial.